One our favorite snacks with a cocktail is Union Square Café Bar Nuts. 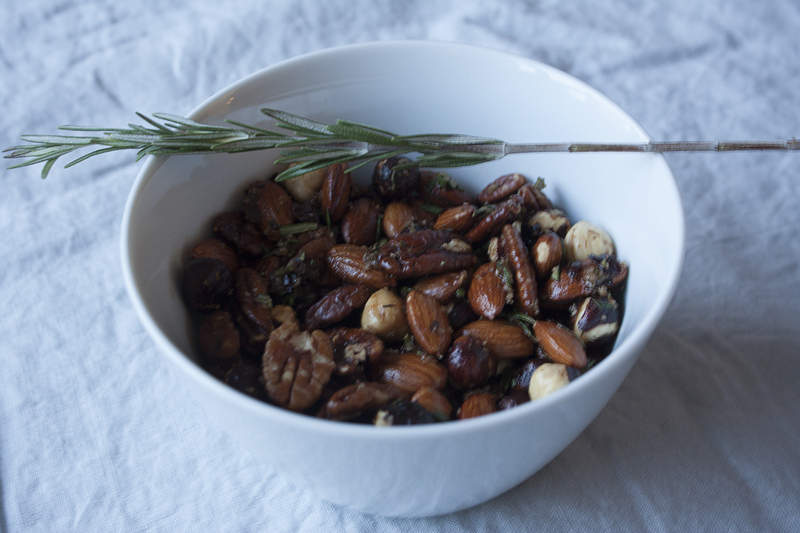 They are a wonderful mix of slightly sweet and salty combined with a little heat from the cayenne in the recipe and the piney flavor of the rosemary. These nuts are impressive enough for company, yet casual enough for drinking a beer and watching a baseball game on TV. In the past, I’ve followed the recipe exactly and used all the varieties of nuts suggested – peanuts, cashews, brazil nuts, hazelnuts, walnuts, and almonds. But in a pinch, like this time around, I had only almonds, hazelnuts and pecans and they were just as delicious, with the hazelnuts being the real standout. I made half the recipe, which is way too much for two people, but they do last for a few days. That is if you can resist eating them!